At its January 2019 board meeting, Connecticut Humanities awarded $171,750 in new Capacity, Planning, and Implementation grants to 12 humanities projects statewide. Recipient organizations span libraries, museums, historical societies, festivals and more. Durham Public Library (Durham): $6,750 – Marketing Assessment and Brand Strategy Development Project: The Durham Public Library will hire a marketing consultant to assist in developing a brand strategy and to design a new logo, tagline, and visual identity. Fairfield Historical Society (Fairfield): $9,980 – Charting the Fairfield Museum’s Next Decade of Success: Fairfield Museum is beginning a new strategic planning effort that will help chart the Museum’s next decade of growth and success. Hill-Stead Museum (Farmington): $20,000 – The Sunken Garden Poetry Festival 2019: The Sunken Garden Poetry Festival is Hill-Stead Museum’s longest-running public program. During its 27th season in 2019, seven award-winning poets will read their work over five evenings from June through August. Set in the historic Sunken Garden, the Sunken Garden is one of the country’s premier poetry events. Bill Memorial Library (Groton): $5,891 – Building Our Future on the Foundation of Our History: The Bill Memorial Library will begin a thorough and formal strategic planning process that will help guide them into their next chapter as a relevant, sustainable, and enriching institution that meets the needs of the citizens of Groton. Connecticut Historical Society (Hartford): $9,999 – Cultural Heritage Archive Project: Connecticut Historical Society receives support for phase I of the Connecticut Cultural Heritage Arts Program Archival Project. The project will establish a professionally organized and catalogued archive of the folklife program, making the archive accessible to researchers as well as members of the communities whose stories and heritage are represented in the collection. Yale University/Yale Peabody Museum (New Haven): $28,641 – Ancient Mesopotamia Speaks: Highlights from the Yale Babylonian Collection: Based on 150+ artifacts, Ancient Mesopotamia Speaks will bring the culture, history, and society of the ancient Near East to life, from the invention of writing in Uruk in southern Iraq during the mid-fourth millennium BC to the last cuneiform texts from the first century of the common era (on view from April 4, 2019 until the end of 2020). Artspace (New Haven): $15,000 – Learning from the Black Panther Trials, 50 Years Later: Artspace will develop an exhibition and related programming to mark the fiftieth anniversary of a watershed moment in New Haven history, the May Day rally in protest of the Black Panther trials in May 1970, laying the groundwork for public programs and an exhibition at Artspace that will run May-September 2020. New Haven International Festivals of Arts & Ideas (New Haven): $9,999 – Community Assessment – Understanding the Ideas Program’s Impact and Opportunities: The Festival will conduct an in-depth community assessment over the next nine months that will solicit input into the relevance of the Festival’s programming and guide the institution and its new leadership into the future. 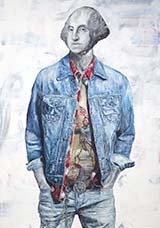 Florence Griswold Museum (Old Lyme): $30,000 – The Great Americans: Portraits by Jac Lahav: The Florence Griswold Museum presents an exhibition of the work of emerging Connecticut artist, Jac Lahav. The Great Americans explores the ideas of who we consider “great” and the cultural underpinnings of our perceptions (whether fact or fiction). Through his cheeky, psychologically complex treatment of iconic figures, Lahav explores the multifaceted nature of cultural identity, calling into question the very notion of “greatness” among American historical figures and exploring the concept of fame itself (on view Feb. 9-May 12, 2019). Keeler Tavern Preservation Society, Inc. (Ridgefield): $9,990 – Visitor Research and Analysis for Project Planning: Keeler Tavern receives funding for a consultant-led initiative to conduct audience research (to gain a snapshot in time) and obtain the internal capacity to conduct audience research going forward (to evaluate results of changes and to track trends over time). Weston Historical Society (Weston): $8,000 – Coley Homestead Interpretative and Wayfinding Program: Weston Historical Society will conduct research for future interpretive signage around the Coley Homestead that shares the history of the property, buildings, and Coley family as well as the workings of a 19th-century farm. Connecticut Humanities offers grants for Planning, Implementation and Capacity Building twice annually with deadlines in November and April. CTH also offers Quick Grants (up to $4,999) every other month. For details and to apply, please visit our grants page. During the 2017-2018 grant cycle, Connecticut Humanities awarded $595,000 to 68 institutions in Connecticut to support history, literature and cultural programming.